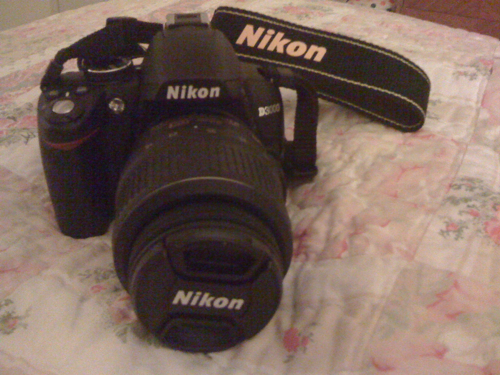 Yesterday I got a brand new camera: a Nikon D3000! About two weeks ago I engaged in Best Buy’s Trade-In program in which you trade in your old electronics for store credit. Our previous camera was having a lot of problems so I decided to trade it in along with my old Samsung monitor and my 4G iPod. After a whole lotta waiting my Best Buy trade-in gift cards FINALLY arrived. Two weeks ago I had confirmation that they had verified the amounts and only last Monday did they tell me the gift cards were shipped out. Friday afternoon the gift card was amongst my mail so I packed up my things and within the hour I was off to Best Buy! I ended up going with the Nikon D3000. Originally I was going to go with the Nikon D60, however not only is it being discontinued but it was completely sold out. Also Joshua’s grandpa called me during the week to talk camera stuff with me and suggested the D3000 as well. I got one hell of a deal on it too! So far I have to say I am VERY happy with my camera! My biggest complaint with my previous camera aside from the battery life was the fact that it didn’t take good pictures without the flash. This camera takes excellent pictures all around. I still have a lot to learn with all the different settings and such.